This month-long voyage on the Marine National Facility research vessel Investigator is exploring Australian Marine Parks in the deep ocean surrounding Tasmania. Scientists are using specially-constructed deep-sea camera systems to study the colourful coral and fish communities that live on undersea mountains and to understand how these communities are changing over time. Although their ‘summits’ can be over 1000 metres below the surface, these seamounts are home to some of the world’s most biodiverse hard coral communities. These corals and all the other fish and critters that live amongst them are specially adapted to survive in their deep, dark environment. This extraordinary undersea landscape is protected in the Huon and Tasman Fracture marine parks off the south of Tasmania. Scientists on board the voyage are helping to monitor the recovery of the corals and fishes since the closure of these seamounts to trawling and their subsequent protection in the Huon and Tasman Fracture Marine Parks. Other seamounts to the east of Tasmania that continue to be fished will also be surveyed. Along the way the RV Investigator will also traverse the Freycinet and Flinders marine parks off the eastern coast of Tasmania. The Australian Marine Parks in the offshore waters surrounding Tasmania protect diverse seafloor habitats and a variety of important marine species. Huon Marine Park is a mountainous place, protecting Australia’s largest known cluster of seamounts. Rising from the seafloor, these curious features are actually the cone-shaped remnants of extinct volcanoes, so literally underwater mountains! They are incredibly important for oceanic and deep-sea environments, providing hard surfaces in an otherwise watery or soft environments. These surfaces provide opportunities for deep-sea corals to settle and grow into intricate 3-D matrices – which in turn provide important food and shelter for many species. Fragile and slow-growing, some of these large corals are many hundreds of years old and incredibly vulnerable to impacts. The seamounts also interact with the water column, giving rise to localised currents and swirling eddies that collect plankton and nutrients, offering feeding opportunities for mobile ocean species such as sharks, cetaceans and billfish. There are 120 seamounts within this park and although some are less than 25 km apart, connectivity between each pinnacle is believed to be quite limited. As such, each seamount is thought to give rise to unique communities. Tasman Fracture Marine Park protects waters near Mewstone, a rocky island that forms part of the Pedra Branca group. Mewstone supports the largest breeding site for the vulnerable Shy Albatross, a species known to forage in the waters of this marine park. The park also supports important foraging grounds for a range of other seabirds including albatross, petrels, and shearwater. Tasman Marine Park also protects a number of important seafloor features including seamounts and ribbons of the West Tasmanian canyons. Freycinet Marine Park is home to an abundance of butterfly perch, deep granite reefs that support the first recorded black corals in Australia, diverse colourful sponge gardens and foraging seabirds. Southern right whales rest in the marine park on their migratory journeys and a number of notable seafloor features are protected including seamounts, the deep-sea abyssal plain and canyons. Flinders Marine Park extends out from the coastal waters around Flinders Island into the deep ocean far offshore. Western areas of the marine park are popular for fishing. Along its length, the marine park protects diverse seafloor habitats and important foraging areas for seabirds, orcas and white sharks. Harrison’s dogfish, a threatened shark species, was recently discovered in the park. The four marine parks being visited on this voyage are part of a much bigger network of offshore Australian Marine Parks that surround our continent. Covering Australia’s enormous marine estate, this network captures the tropical waters of the Coral Sea to Ningaloo in the west, Norfolk Island in the east and the sub-Antarctic Southern Ocean waters around Macquarie Island in the south. It is the world’s largest representative network of marine protected areas, safeguarding 2.8 million km2 of Australia’s offshore marine environment. Australian Marine Parks play a vital role in protecting the biological, social and economic values of our ocean and these parks are managed for the benefit of all Australians. Australian Marine Park managers from Parks Australia will join the multi-disciplinary science on board the RV Investigator. 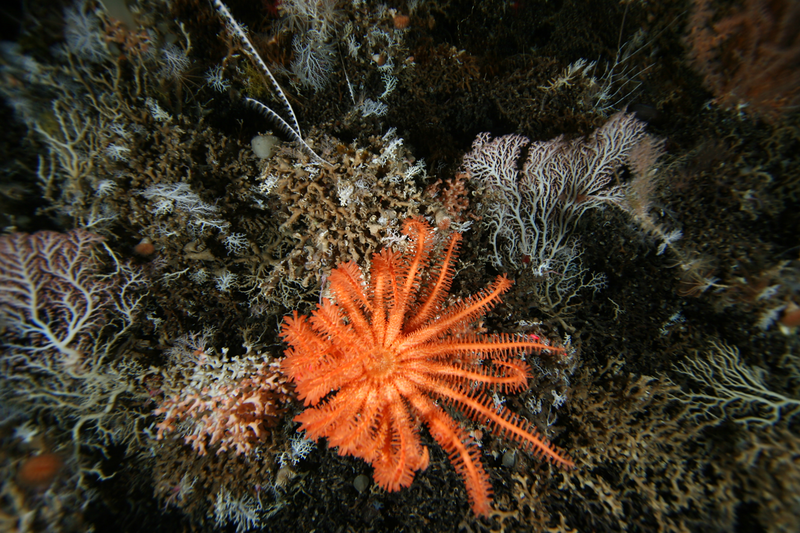 Results from the Seamount Corals Voyage will help us better understand how long-lived and slow-growing deep-sea corals are recovering since marine park protection was put in place. This research will also broaden our general understanding of the unique and unusual habitats and species seamounts support. This voyage marks more than 20 years since the seamounts were first systematically surveyed, providing an important long-term data set about our ocean depths. Given the challenges associated with carrying out these deep-sea explorations, scientists are rarely able to repeat surveys in this way so the data coming out of this voyage will be of global importance. The cluster of seamounts south of Tasmania are so unique that when they were first mapped in the late 1990s they were quickly recognised as being of global importance. With the help of trawl fishers who worked with scientists to locate and identify the seamounts, the area was formally protected as the Tasmanian Seamounts Marine Reserve and later incorporated into the Huon and Tasman Fracture Marine Parks when the South-east Network was declared in 2007.